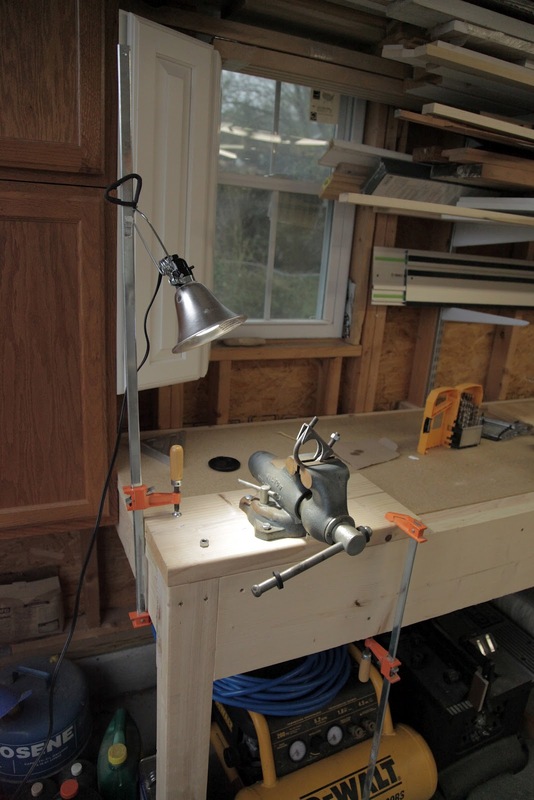 I have almost completed the ubiquitous/obligatory power-tool-beater-bench. It isn't pretty, it's not elegant, and it certainly is not an heirloom piece. It is, however, rock solid and sturdy enough to dance on (I may know from experience) and it should be perfect for everything from hammering away on some metal to setting up cuts on the radial arm saw. 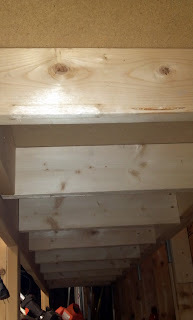 At this point it merely needs some holes drilled into the top and front to accept several pipe clamps and needs some work with a forstner bit to allow me to install the Leigh Hold Downs. 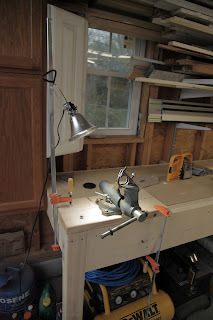 The first bench accessory is a metal vise bolted to a scrap piece of 2x12 (very intuitive and creative, I know, I'm amazing). 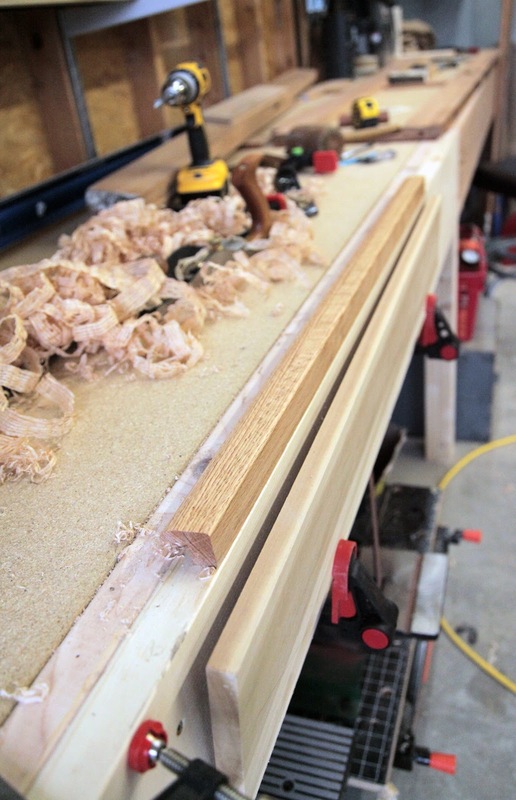 I plan to put all the interchangeable accessories on the same length of 2x12 so that I can slide them in and out of a shelf that will eventually go below the bench, to include a larger (much larger) piece of countertop for the lathe. The legs are flush with the front face (a lesson from classic styled woodworking benches) to allow for clamping across the entire face of the bench. The support structure is constructed of 2x6 "joists" which tie into the wall and the face of the bench. The face is 2-2x12s set flush with the top which allows clamping along the leading edge of the bench. 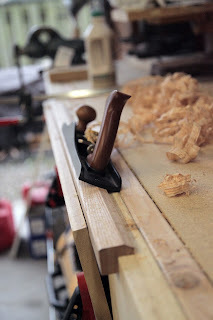 Inset into the top is the radial arm saw, which swings out of the way when not in use. 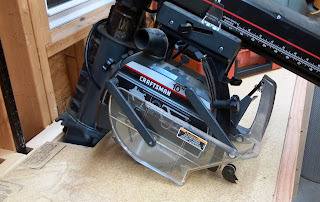 I have already put this little fella to use, as my shop developments have been temporarily halted due to some attention required on projects around the house in preparation for a massive first birthday party we are throwing. Something about birthday parties for infants is hilarious, they have no idea what is going on but all the adults seem to have a blast...plus there's cake!